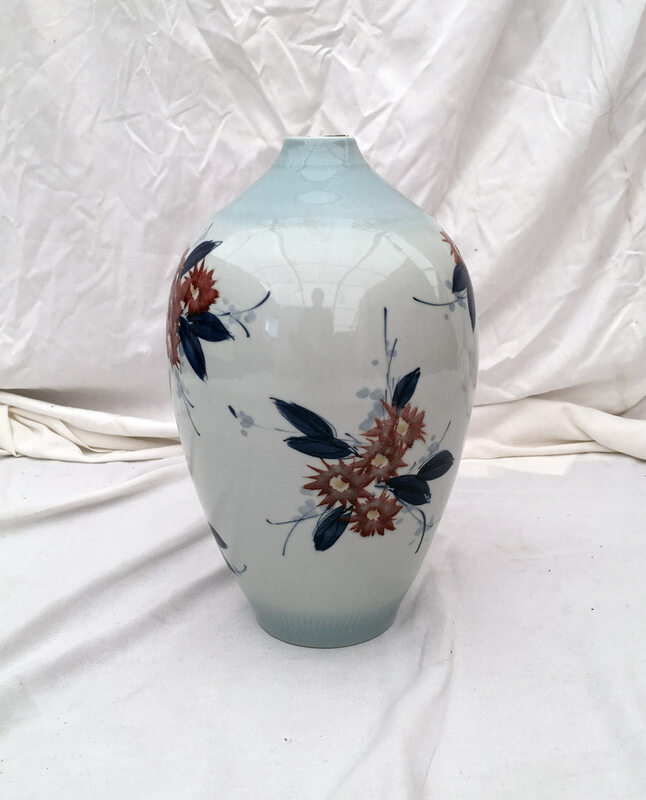 The photographs below are example lots from our current UK auction program, please note that some specific items may already be sold but similar items from these categories will be avilable. 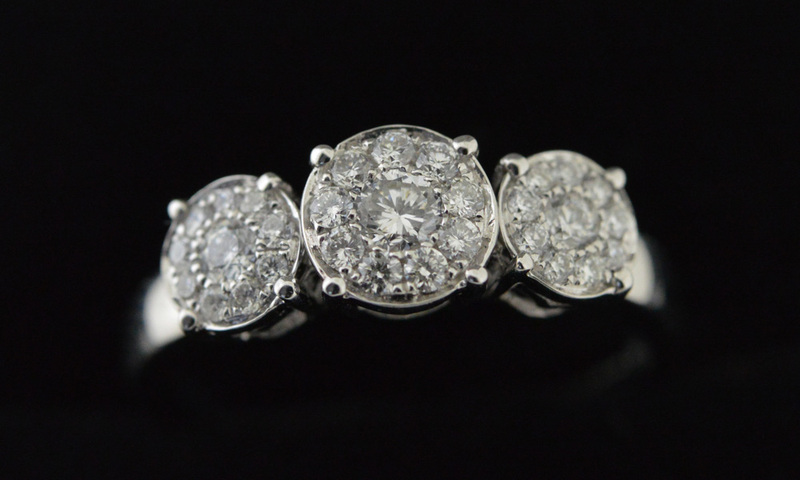 Set in Platinum this is a stunning Oval Cut Champagne Diamond surrounded by Brilliant Round Cut Diamonds. 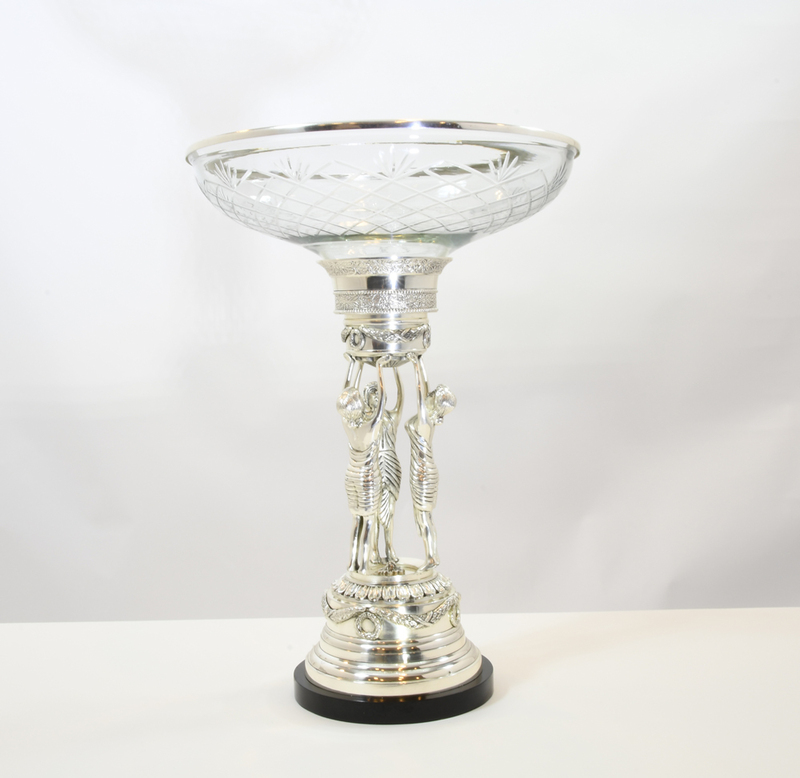 An Insurance Valuation Certificate which includes a Full Grading Report is supplied with this item. 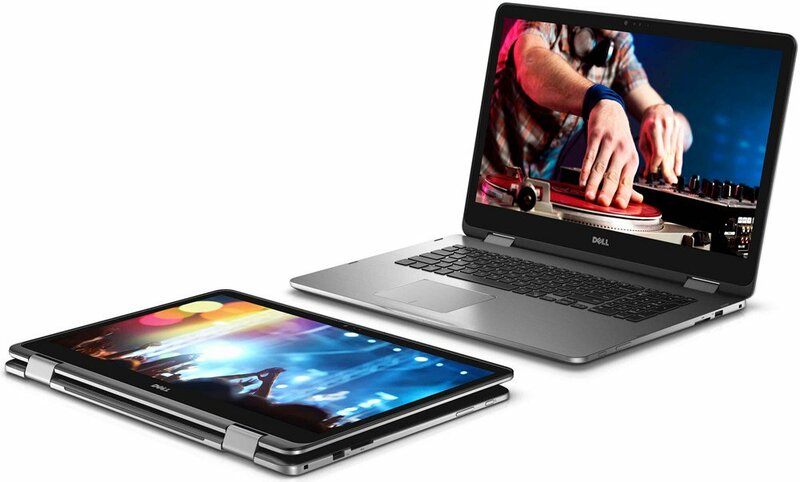 Dell XPS Laptop 13.3" QHD TouchScreen (3200x1800) with Intel i7 processor (up to 4GHz) 16gb memory, 1TB Solid State Drive, Fingerprint Reader. 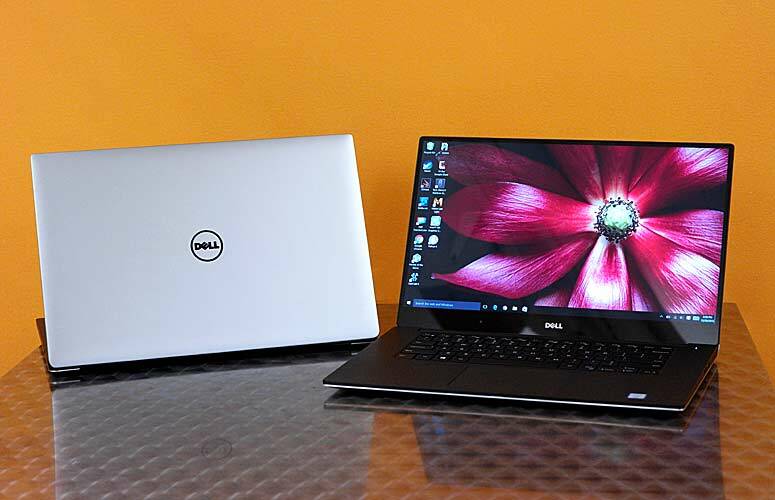 Brand new and boxed with Full Dell Warranty. Set in 18ct Gold this is a beautiful line bracelet set with oval cut emeralds and round cut diamonds. 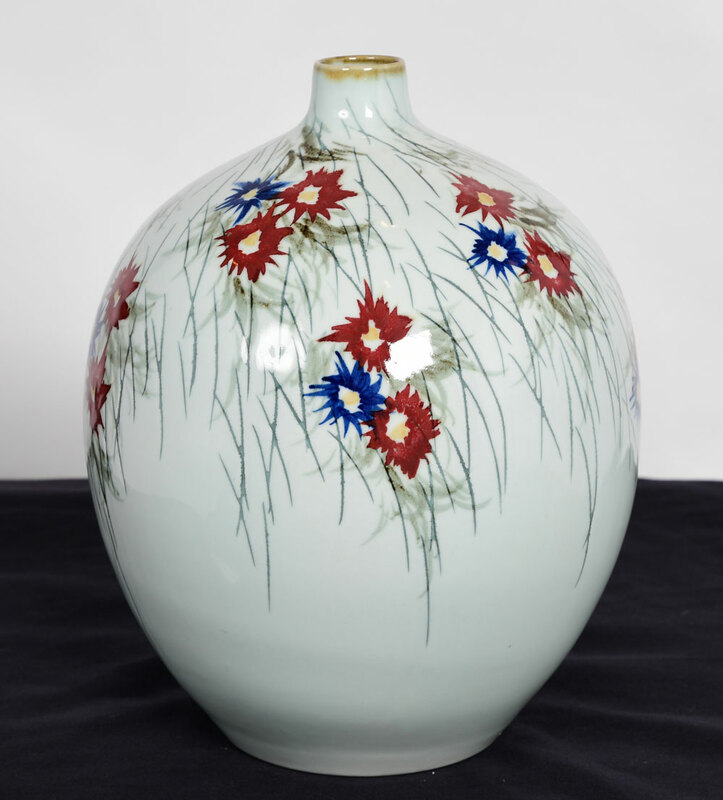 An Insurance Valuation Certificate which includes a Full Grading Report is suplied with this item. 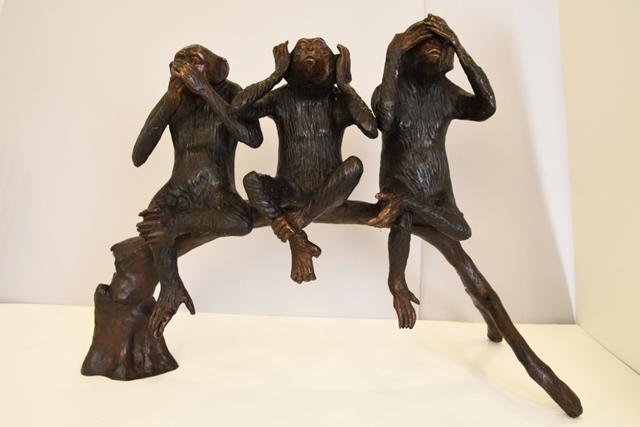 "Hear no evil, Speak no evil, See no evil" Fabulous Bronze Casting of 3 Monkeys. This is a truly STUNNING ring! Set into 18ct White Gold with a 4.0ct Round Brilliant Cut Solitaire Diamond. This ring comes with Full Certification and an Insurance Valuation Certificate which includes a Grading Report. Cased Nocturne (1.5L) of Famous Taittinger Champagne. 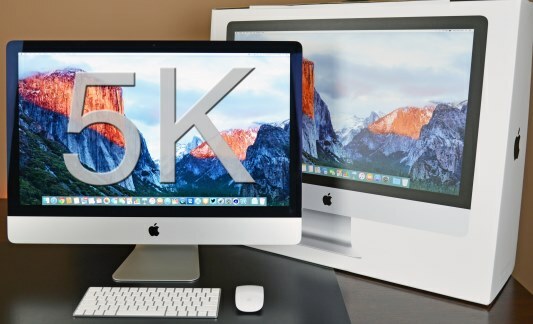 Lot 8190 is a brand new iMac with a 27” 5k (5120x2880) Retina screen, 1TB Fusion drive, Intel i5 processor and 8GB memory. Sealed with full manufacturers warranty. Complete with wireless keyboard & mouse. 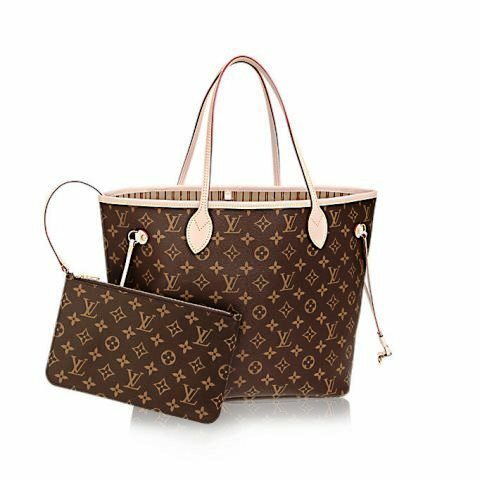 BRAND NEW genuine Louis Vuitton bag. 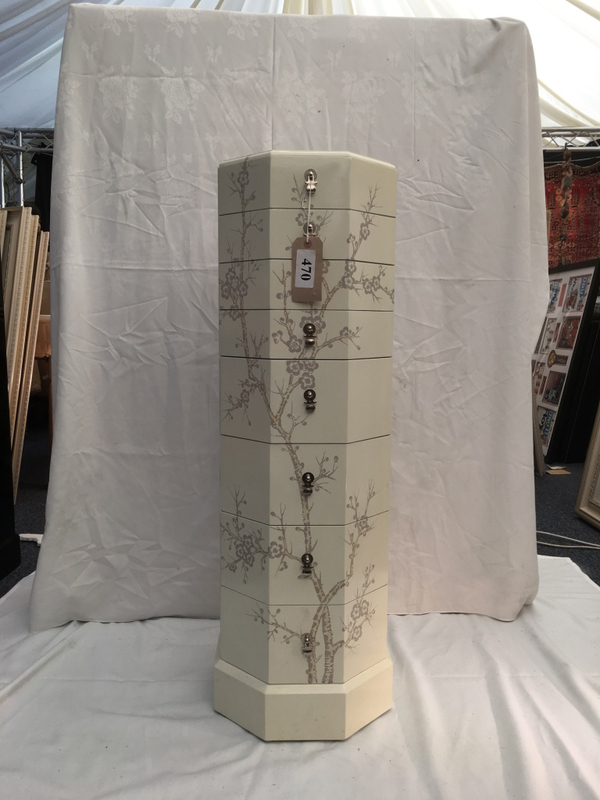 Painted for the Royal Wedding. 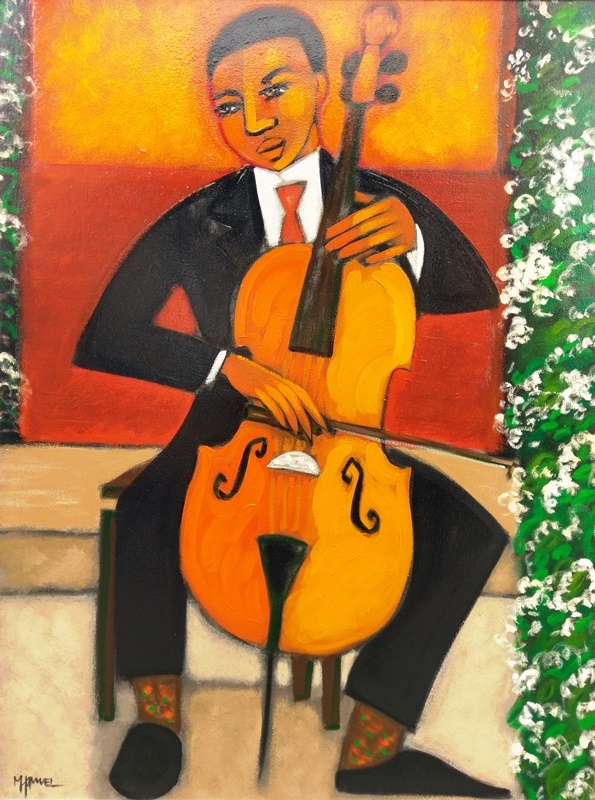 Depicting the famous Cellist "Sheku Kanneh-Mason" This fabulous original painting is complete with frame and certificate of authentication. 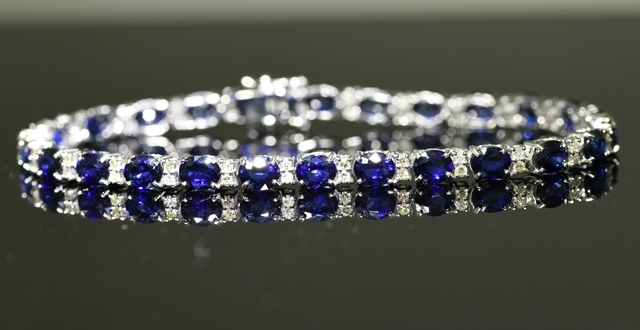 Set in 18ct Gold this is a beautiful line bracelet set with oval cut tanzanite and round cut diamonds. 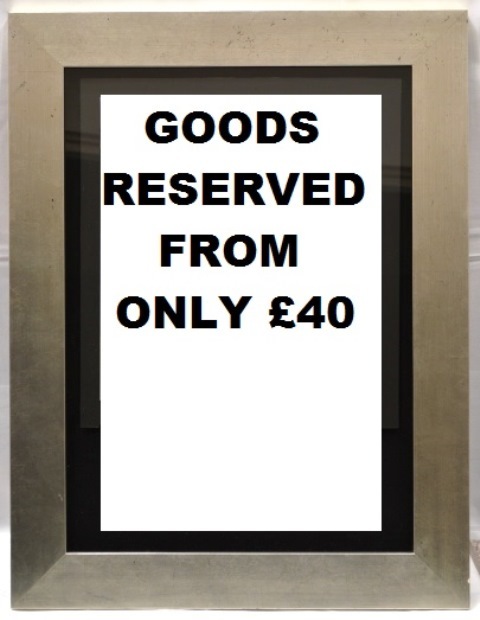 An Insurance Valuation Certificate which includes a Full Grading Report is supplied with this item. 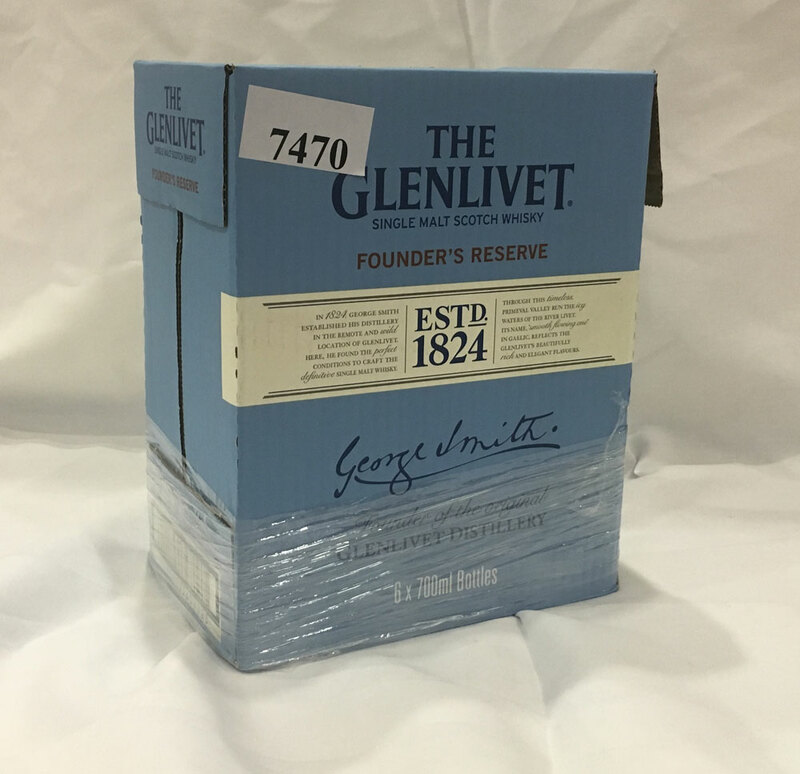 A Case of 6 Bottles of this very popular Single Malt Whisky. A very large fabulous Limited Edition by the great American pop artist Kevin Kelly. Just check out any Breitling store and you will see his art on their walls! One of only 75 restricted copies available Worldwide. Complete with signed certificate by the artist. 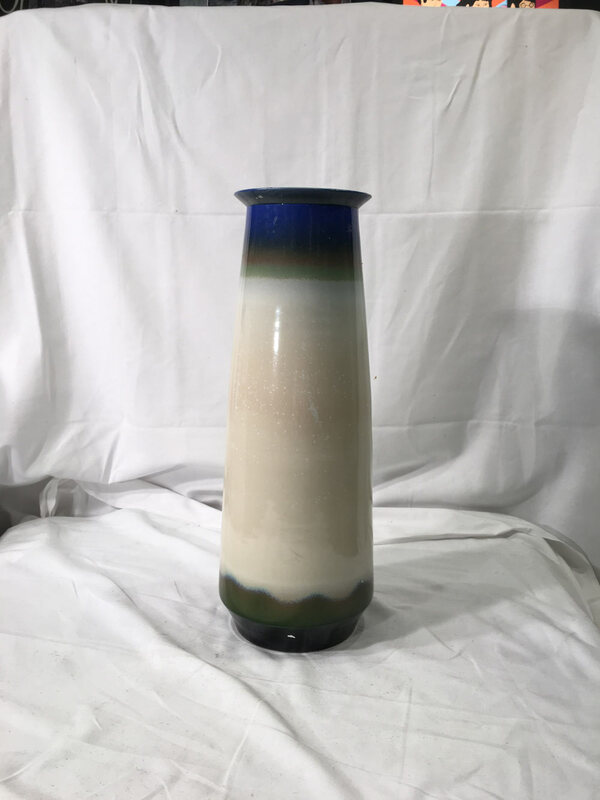 The quality of this item is exceptional. Multiple Lot of Dell 13.3" Touchscreen Laptops. Brand new boxed with full Dell warranty. 4gb memory, 1000gb hard drive. Full HD (1080p) screen. Case of 6 Bottles of Bombay Sapphire Gin. Late Entry- Offered at only £20 the full case. 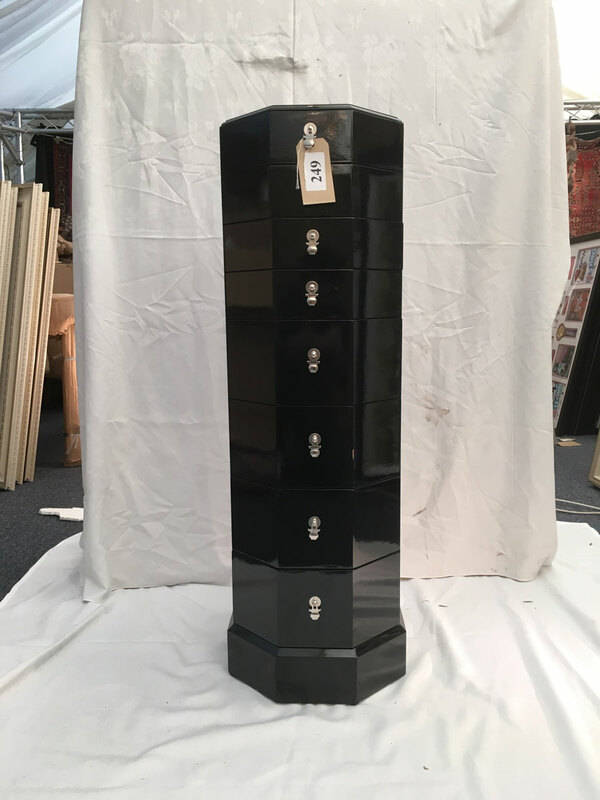 This is only a small selection of categories from this vast Auction inventory. 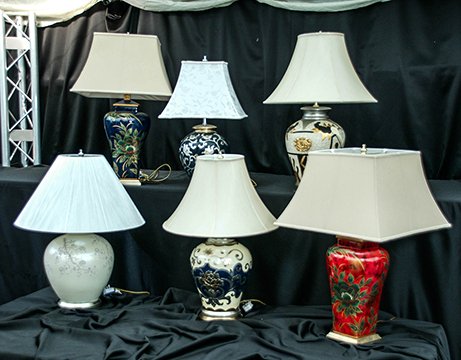 We strongly advise attendance to fully appreciate the quality and price of the goods on offer. A stunning white gold graduated line bracelet set with 5.15cts of Diamonds. 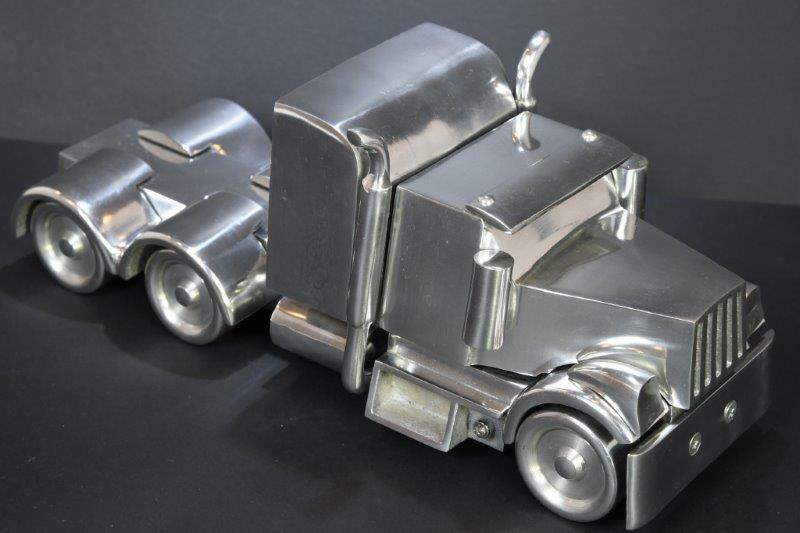 Comes complete with an insurance valuation certificate including a full grading report. Brand new sealed sim free IPhones .......... All UK issued! 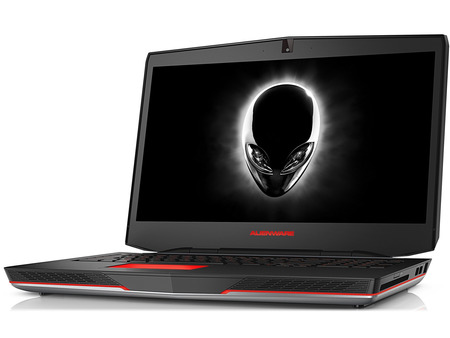 PC5 Evolution 1st Release. Islay single malt distilled at Bruichladdich Distillery. 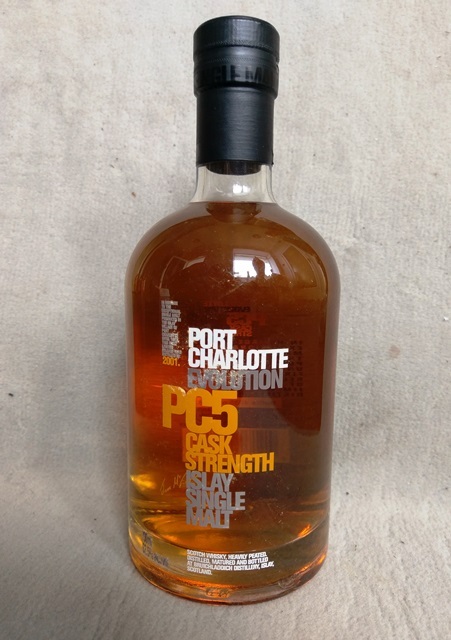 1st ever distillery bottling, very collectable & much sought after. 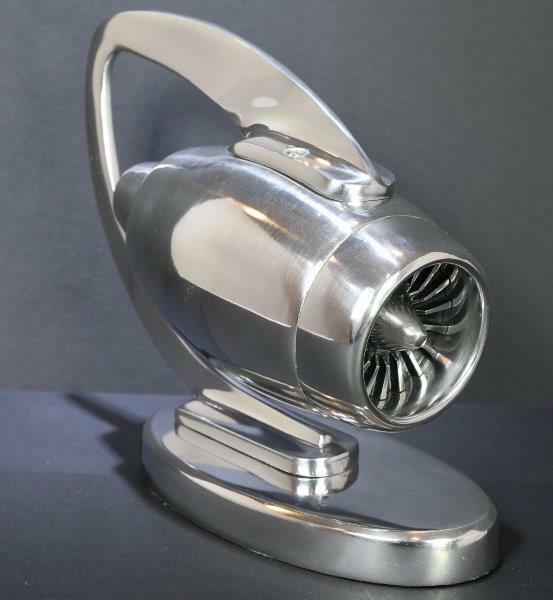 We are very fortunate to offer for sale this limited edition by L.S. Lowry. 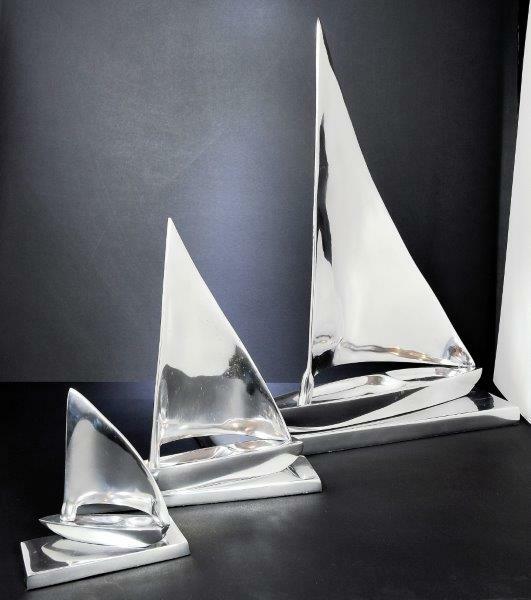 The one pictured “THE DOCKS” is from a special edition limited to only 75. Comes with authenticity and a valuation. Superbly framed. This incredible image of the "Gorilla family" is wonderful piece of work from this artist. 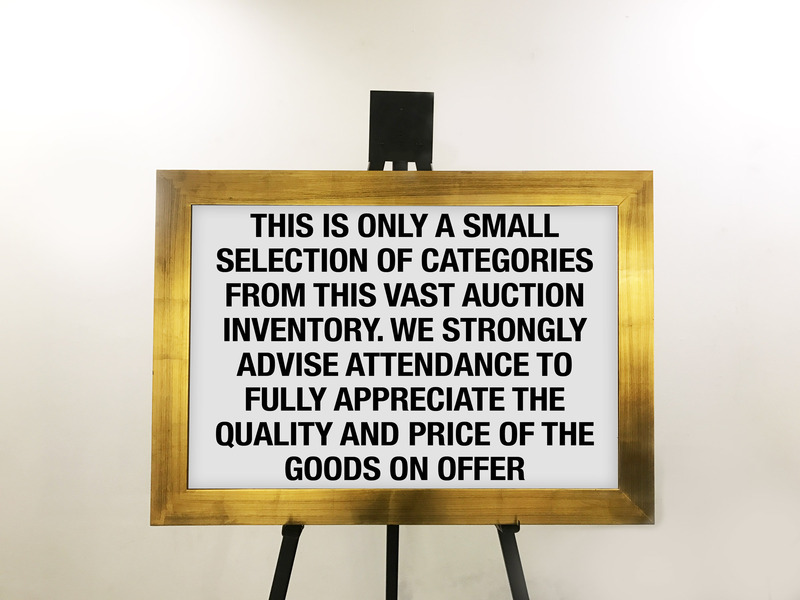 This large original painting is beautifully framed and comes with a Valuation & Authenticity Certificate. This very popular premier Vodka has a case quantity of 6 bottles. 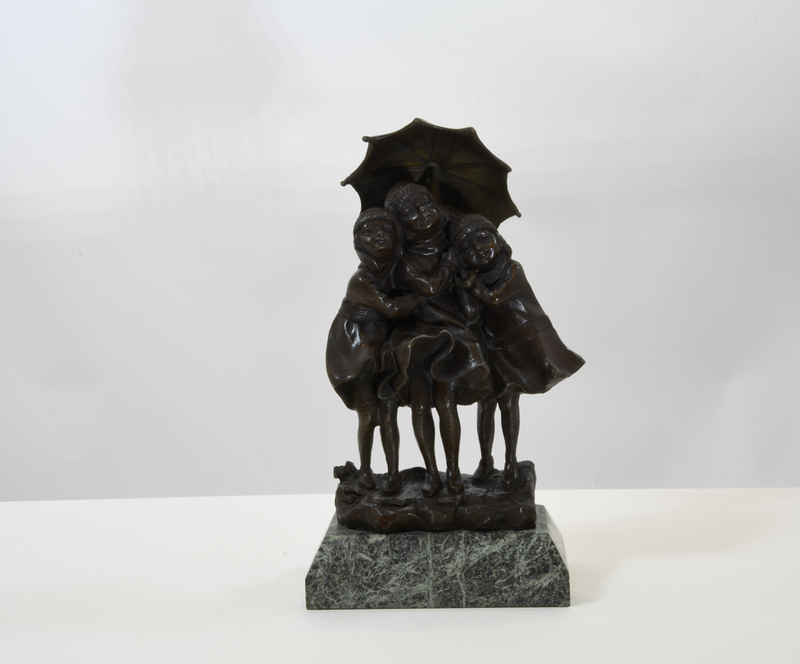 Quirky Metal Wellington Brolly Stand. Assorted Apple MacBook Pro & MacBook Air to be sold. 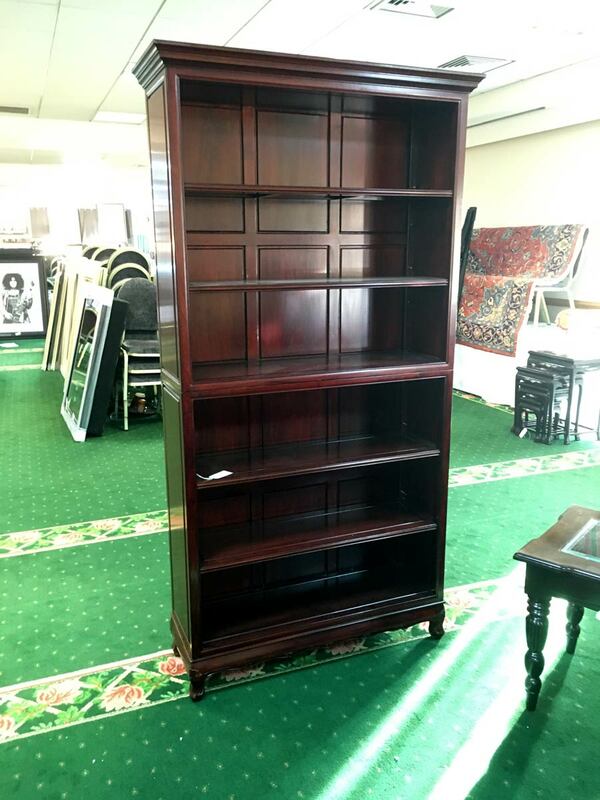 All brand new & sealed boxes with full Warranty. All UK issued. 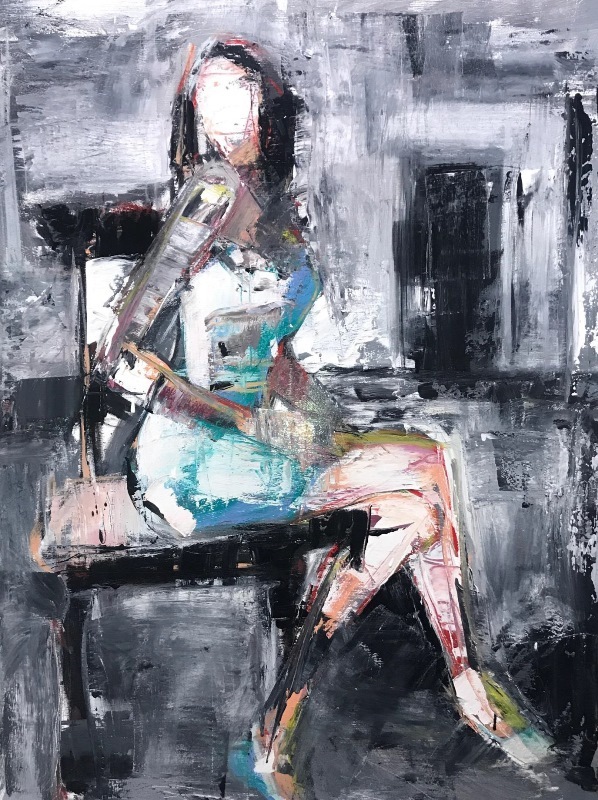 A lovely original painting by this fabulous Irish artist. Beautifully framed to a high standard. 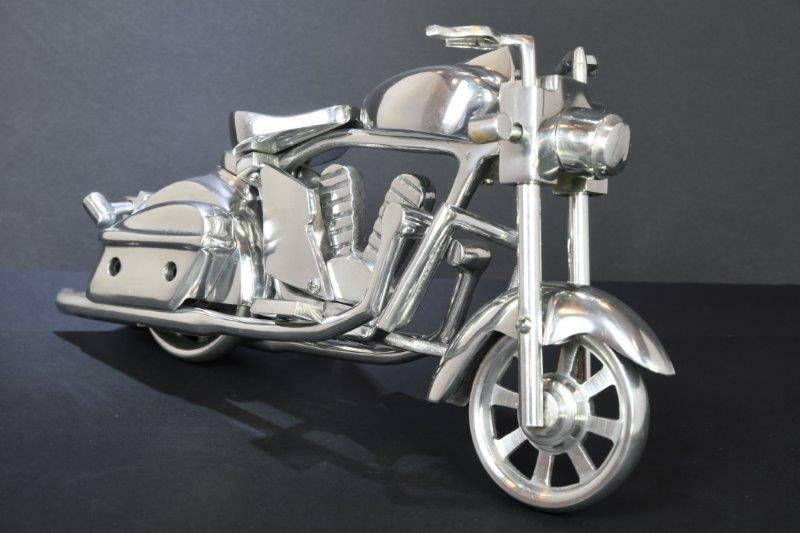 Comes complete with Valuation and Authenticity certificate. A rare limited edition by American Artist Sidney Maurer (Died 2017) Title - “Iconic Reflections” (Marilyn Monroe) One of only 95. It comes with a signed certificate from the Artist. 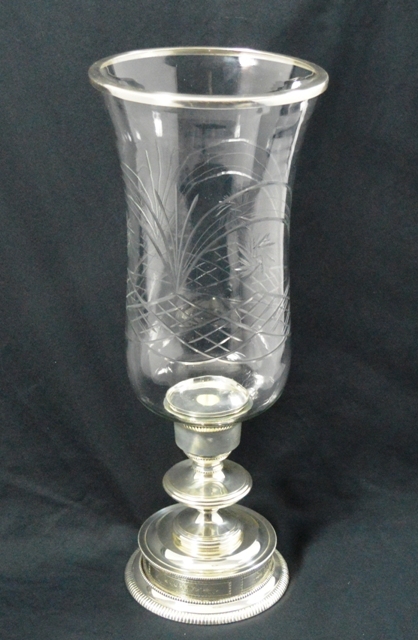 Supplied with a valuation certificate. One of only 100 worldwide. Title- "Young Lady with Gloves" This has the official "Lempicka Estate" of New York embossed stamp.\nValuation for £1500 and signed certificate will also be supplied with this wonderful framed piece. 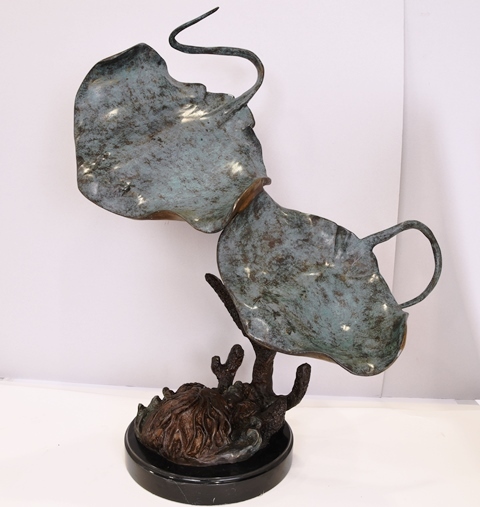 Titled "Frankel" after the famous racehorse. Only 95 ever published and signed by the artist. 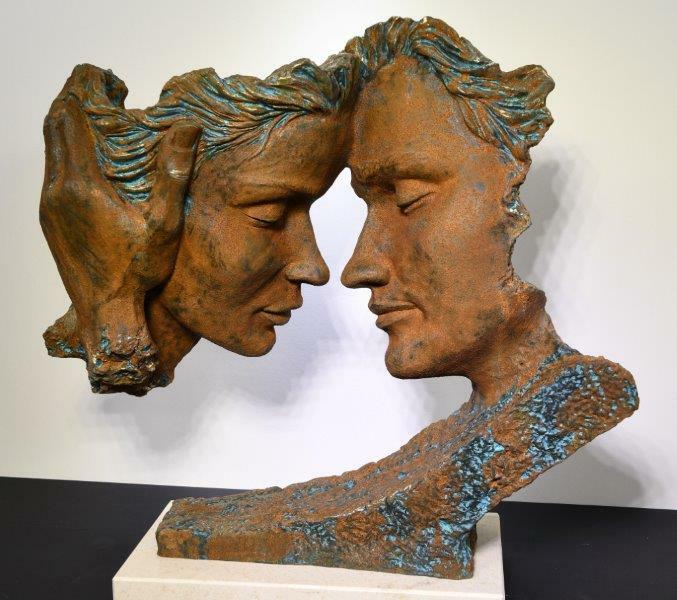 Valuation for £1250 will accompany this framed limited edition. Set into 18ct White Gold, this is a beautiful Ruby & Diamond Line Bracelet. The bracelet has over 12cts of Oval Cut Rubies set with Round Cut Diamonds. 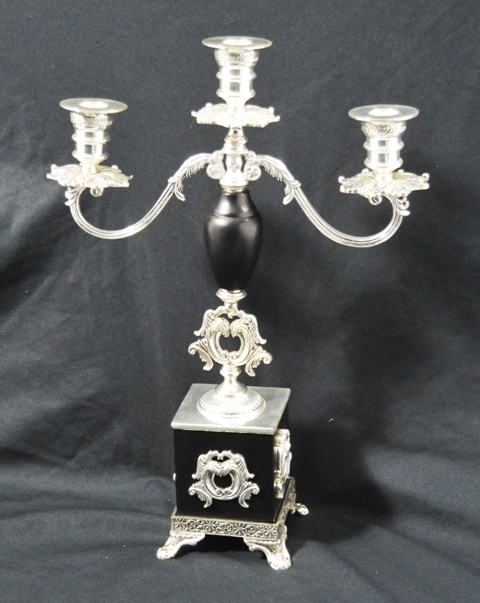 Supplied with an Insurance Valuation Certificate which includes a Grading Report #1711. Original oil on canvas by this skilled Canadian artist. 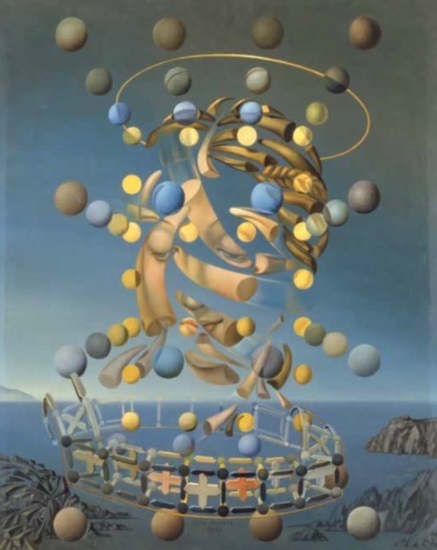 This painting comes beautifully framed and with full valuation. 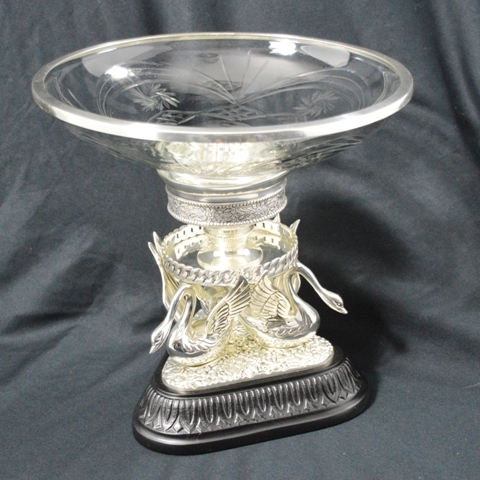 Very nicely cast three lady figures holding up a cut glass bowl. 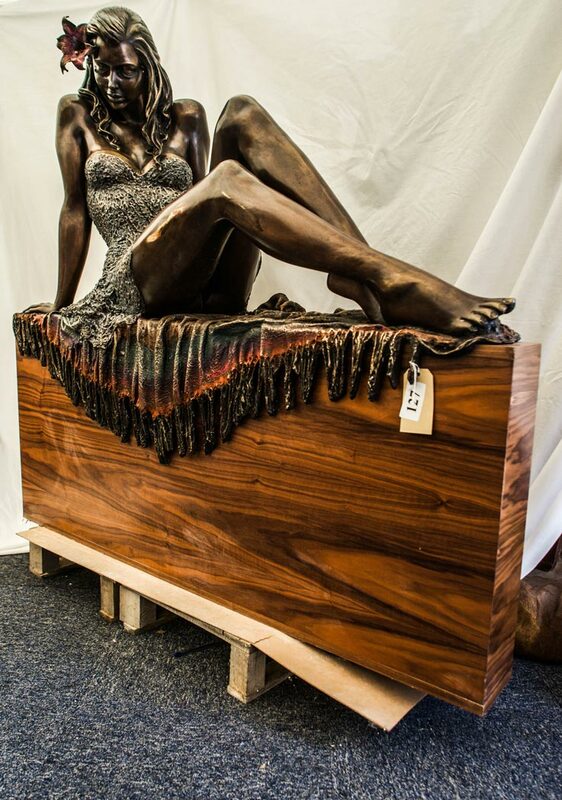 A superb example of fine art from this talented Irish artist. 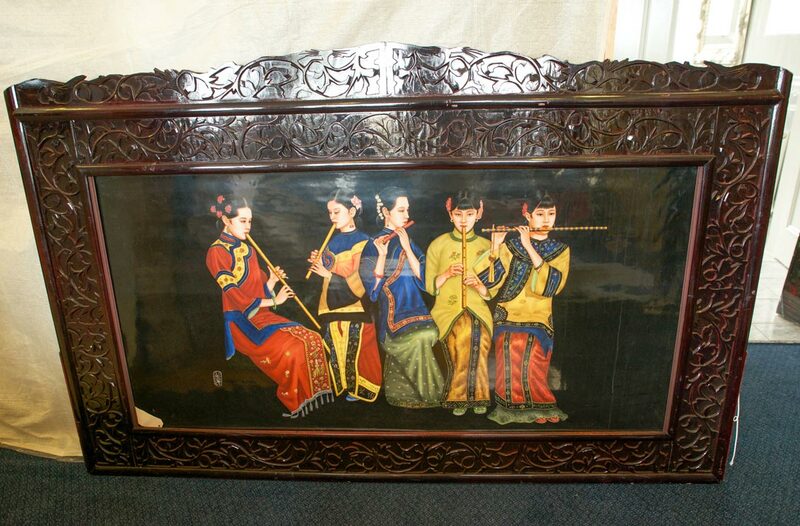 This large painting is beautifully framed and comes with a full valuation. 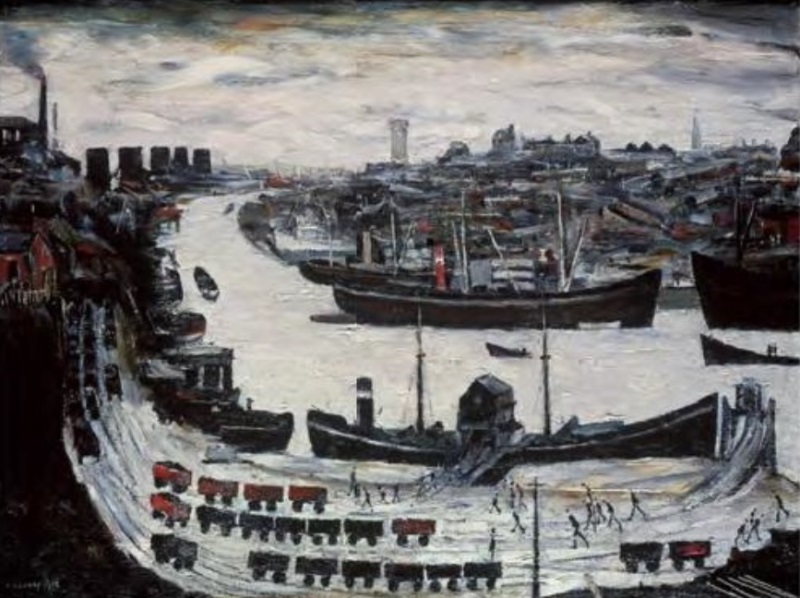 A fantastic framed Lowry “The Canal Bridge, 1949” only 85 in this special worldwide limited edition, It comes with its own numbered certificate and Valuation. 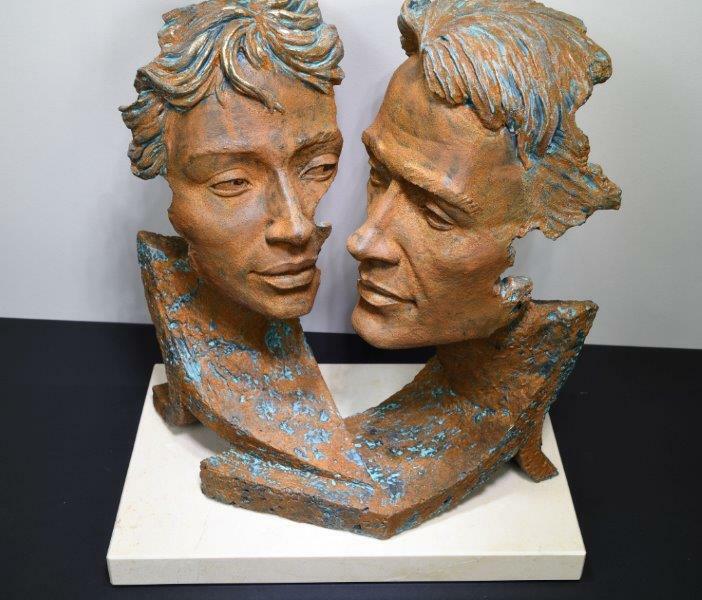 A Limited edition by this fabulous Canadian artist. One of only 25 ever published. Beautifully framed and complete with valuation. One of only 25 published worldwide. Beautifully framed. 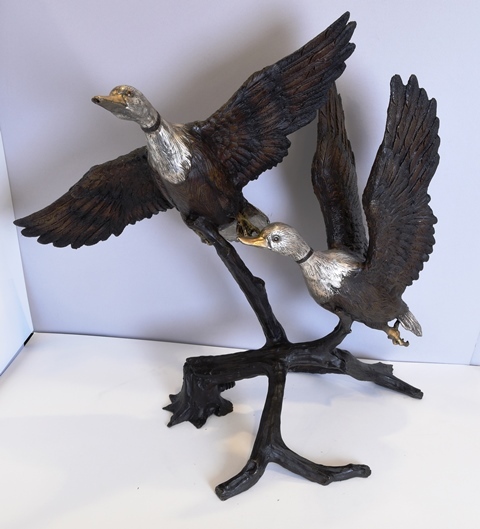 Large Bronze Sculpture of Flying Ducks. 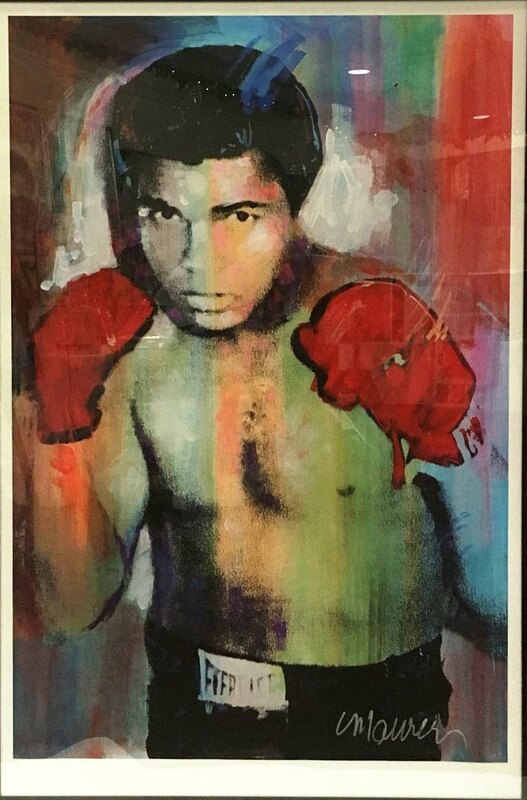 A rare limited edition by American Artist Sidney Maurer (Died 2017) Title - “The Greatest” the one and only Muhammad Ali. 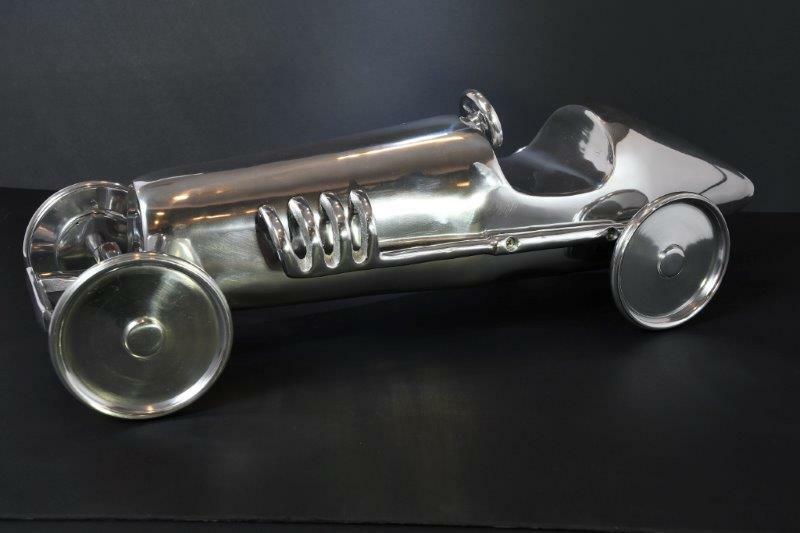 Only 95 of these exist in the world, it comes with a signed certificate from the Artist. 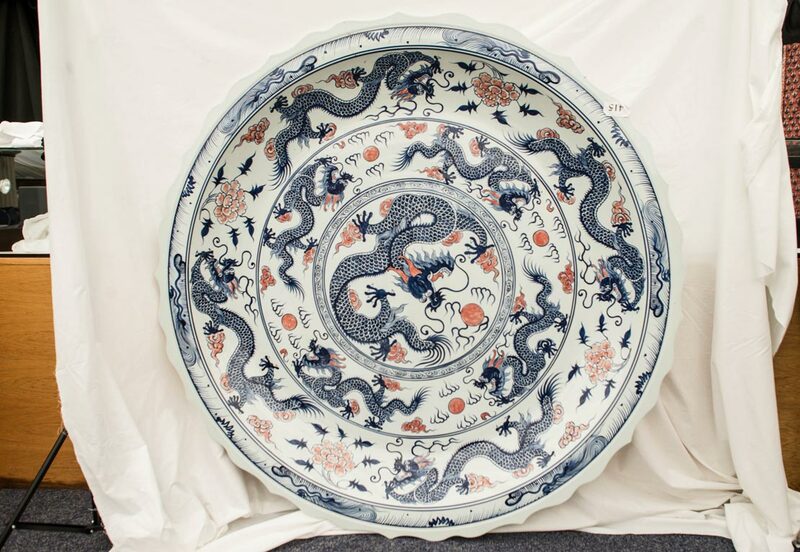 Supplied to the successful bidder with a valuation certificate. 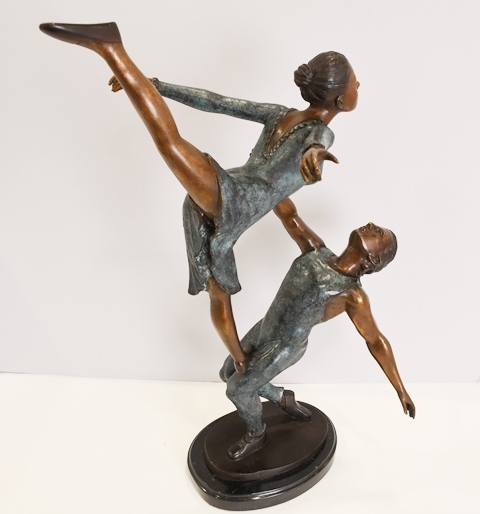 Beautiful Sculpture of 2 Dancers. An impressive framed and numbered limited edition from this very imaginative artist, this special Gouttelette edition was taken from the original painting “The Maximum Speed of Raphael’s Madonna, 1954” and is limited to a worldwide release of only 75. 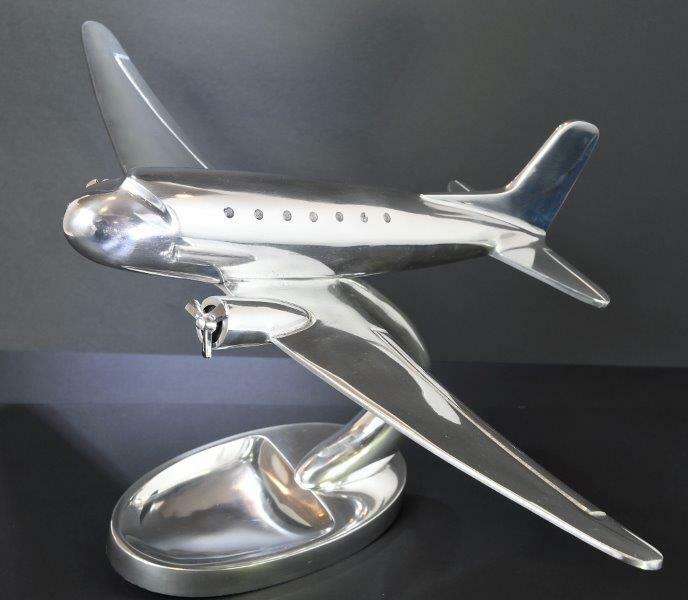 Complete with a Valuation & Authenticity Certificate. 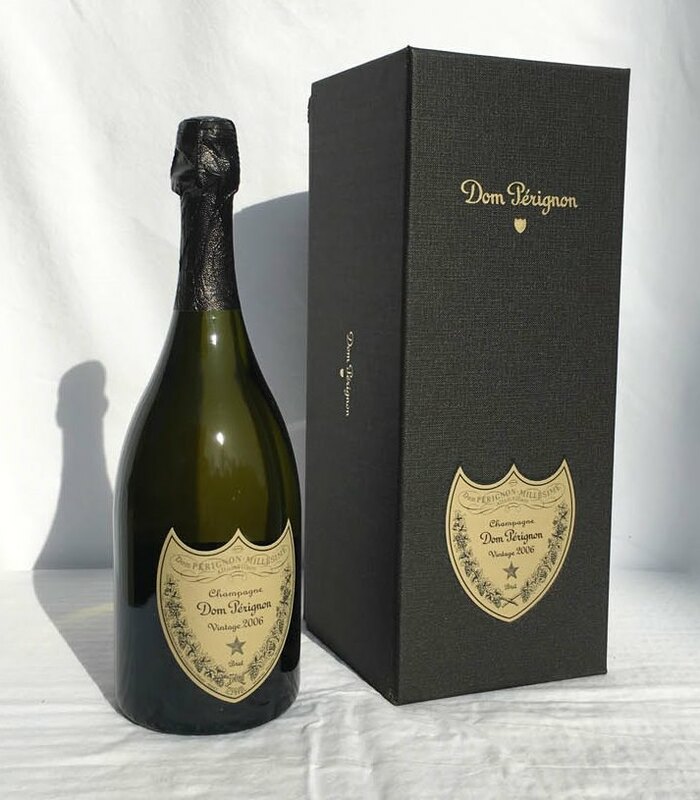 Vintage 2006 Dom Perignon Champagne. 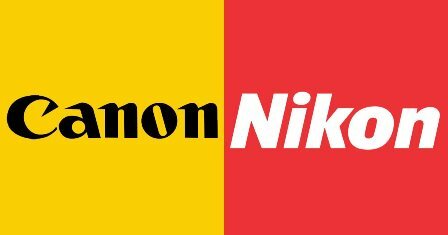 Brand New DSLR Cameras with Full Warranty. 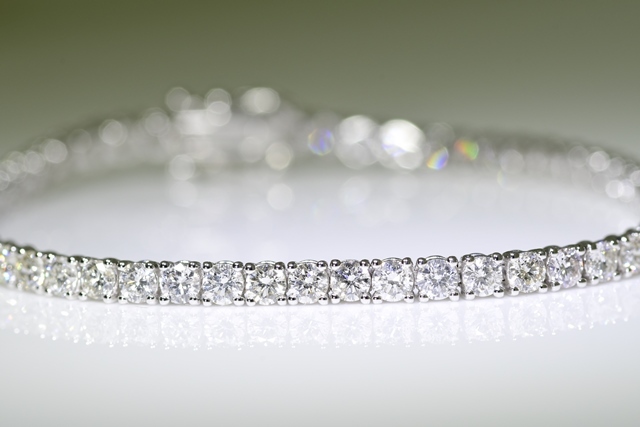 Diamond "line" bracelet with a total diamond weight of 4.94cts of brilliant round cut diamonds. The Lot number for this item is 1707, along with this bracelet you will receive a Full Valuation Certificate & Diamond Grading report. 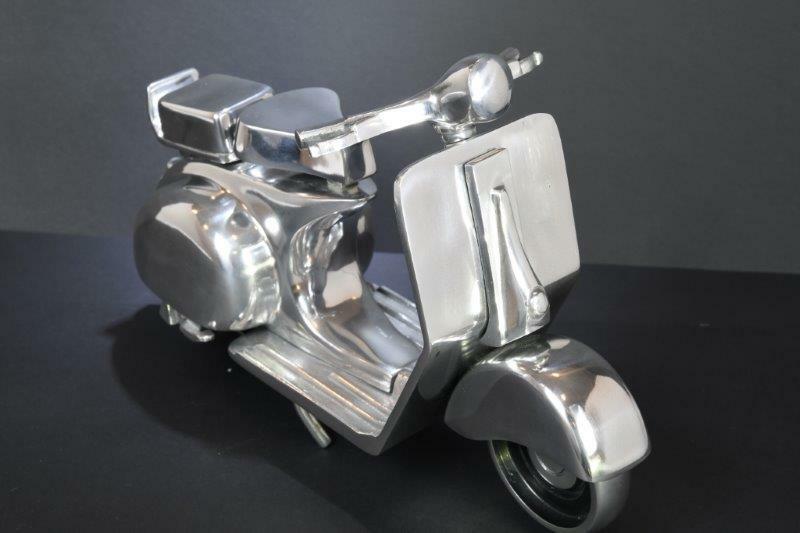 "Vespa" Scooter cast in Metal. 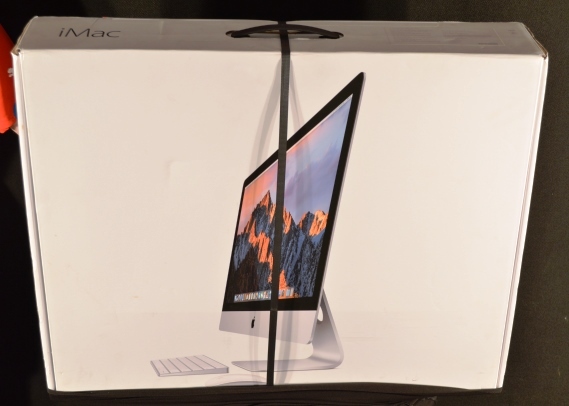 Brand new Apple iMac 21.5" 4K Retina Screen with Keyboard & Mouse. "STREET SCENE, PENDLEBURY" This fabulous example of the great L.S. 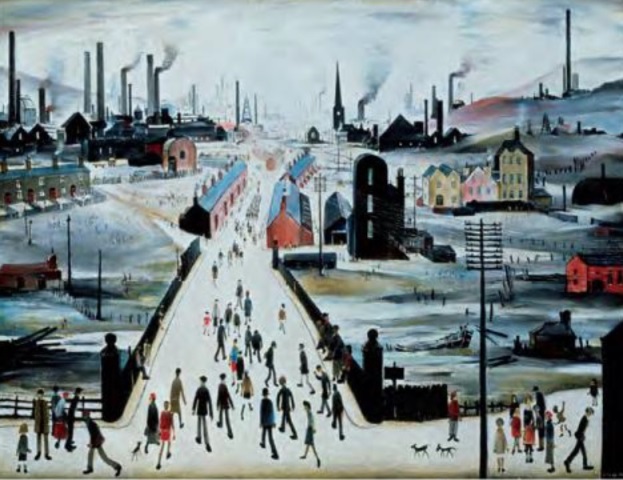 Lowry's work. 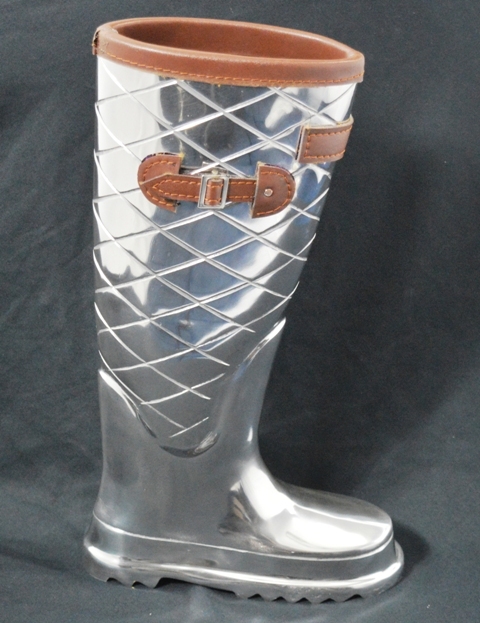 Limited Edition Gouttelette one of only 95 Worldwide. 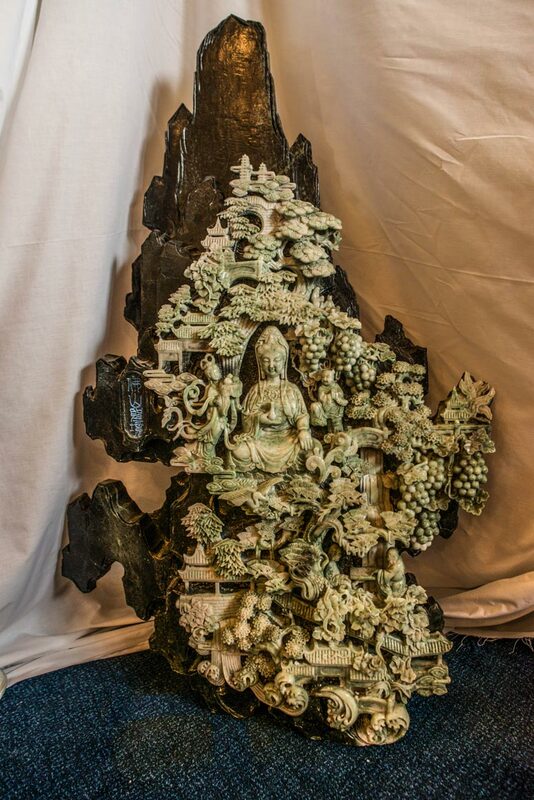 Beautifully framed & comes with full valuation & certificate of authenticity. 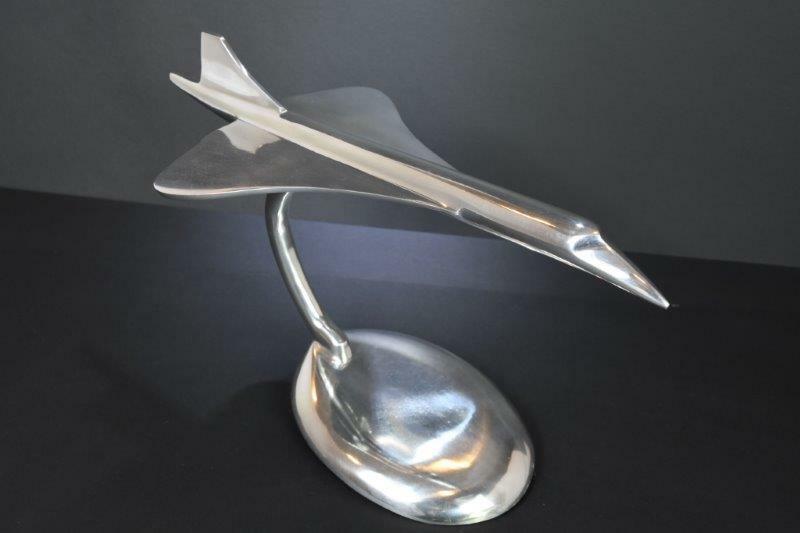 Great collectors piece. 64GB *Brand New with Full Manufacturers Warranty & Guarantee. 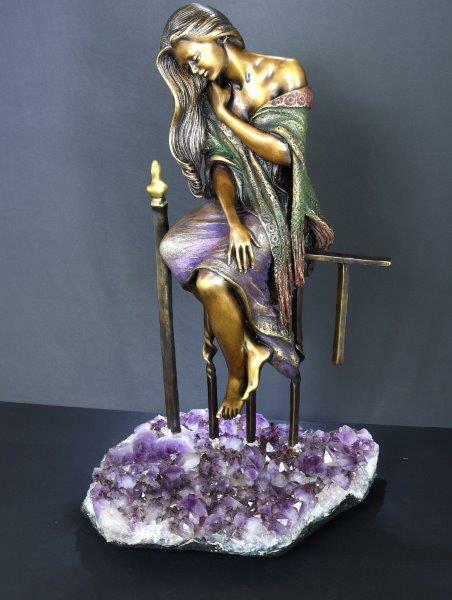 The Lovers Sculpture set on a Marble Base. 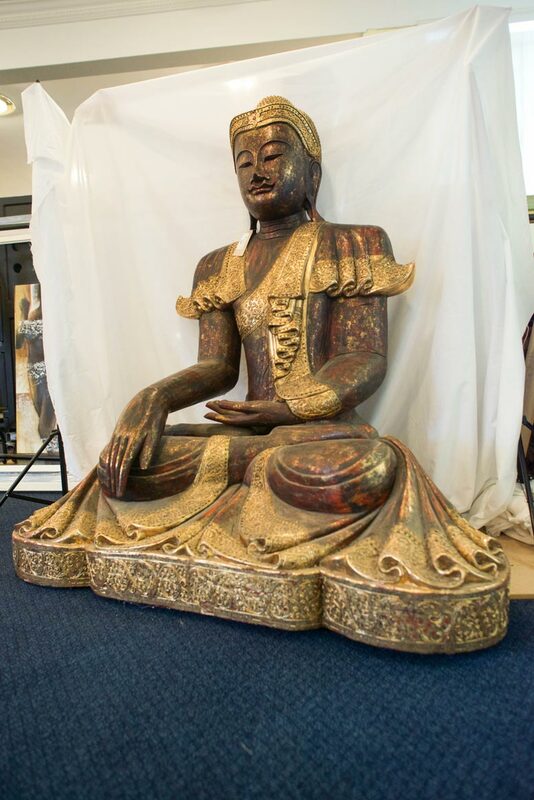 Amazing Hand Carved Buddha approximately 5ft High! 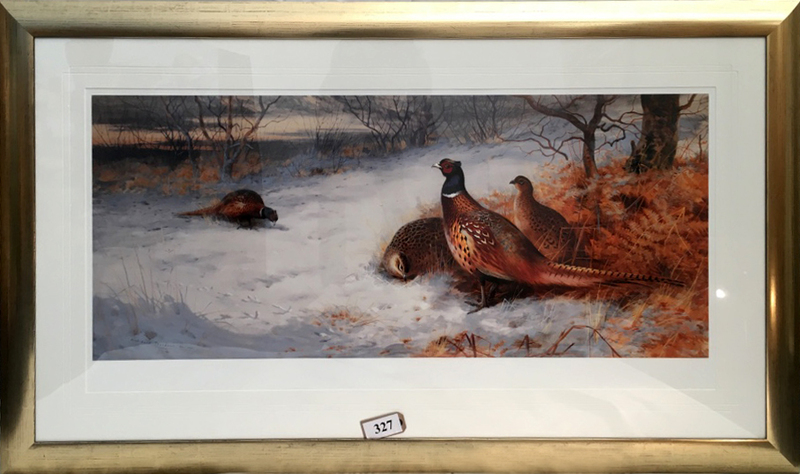 Beautifully framed Ltd Edition by one of the greatest British watercolour artist ever. 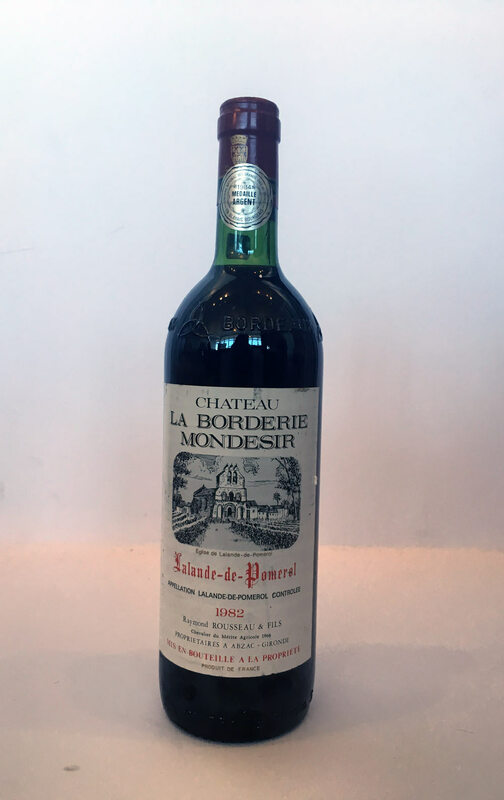 A rare Chateau Cheval Blanc 1964, St Emilion 1st Grand Cru Classe. 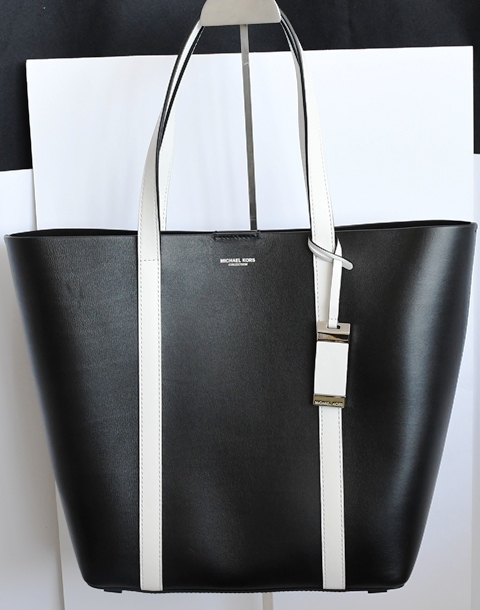 "Calf" Leather Black & White Michael Kors "Collection" Handbag. Very high quality with beautiful detailing. This artists work is always fabulous, this large painting of a White Tiger is no exception. 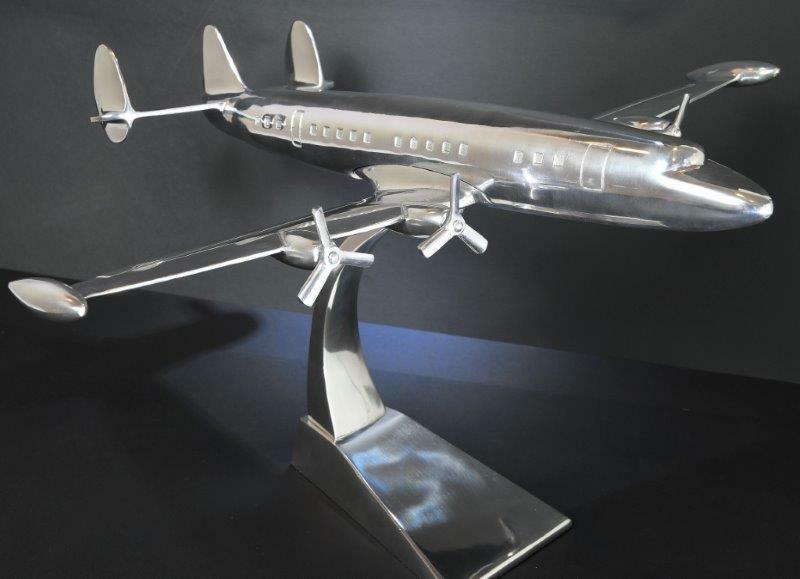 Framed to a high standard & comes with a full valuation certificate. A stunning colourful original by this highly rated artist. This is a large painting which has been beautifully framed. Complete with valuation certificate. Set in 18ct Yellow Gold, with an Oval Cut Emerald surrounded by Round Cut Diamonds. This ring comes with a Valuation Certificate which includes a Grading Report. 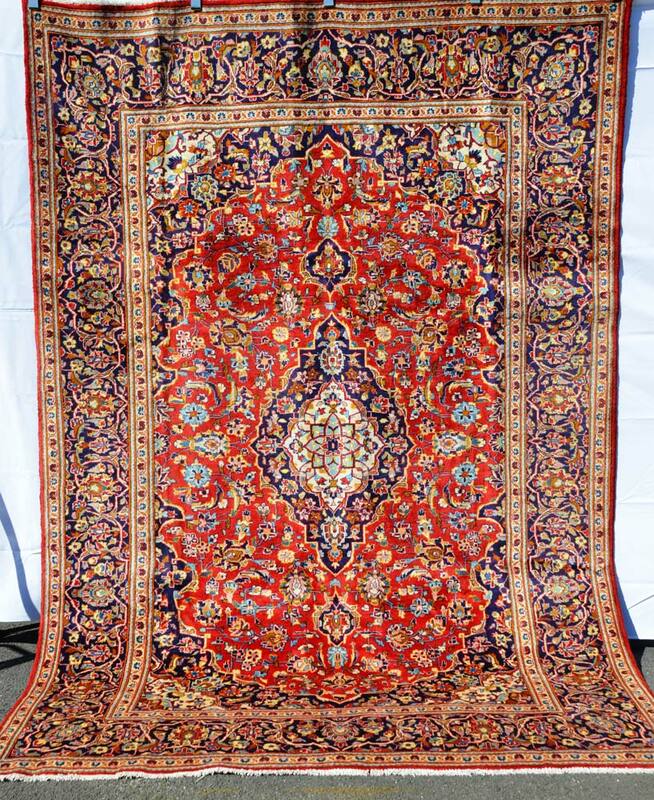 Large carpets, Runners & Rugs from 3ft to 13ft. 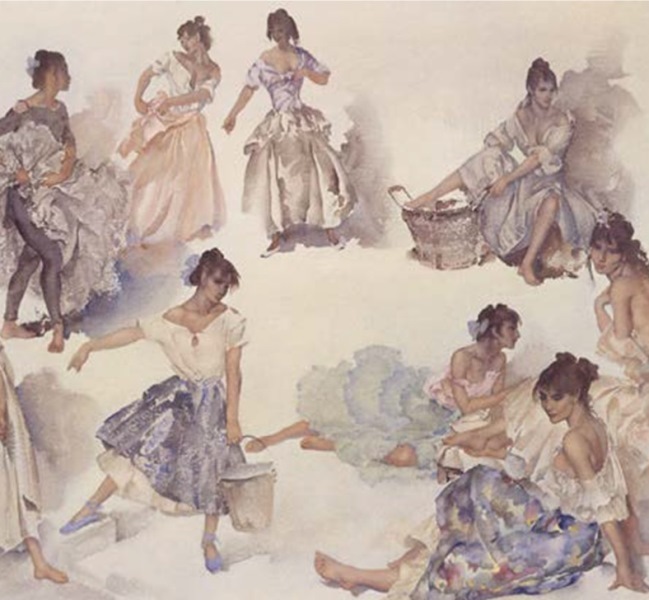 in Assorted Widths and Designs. 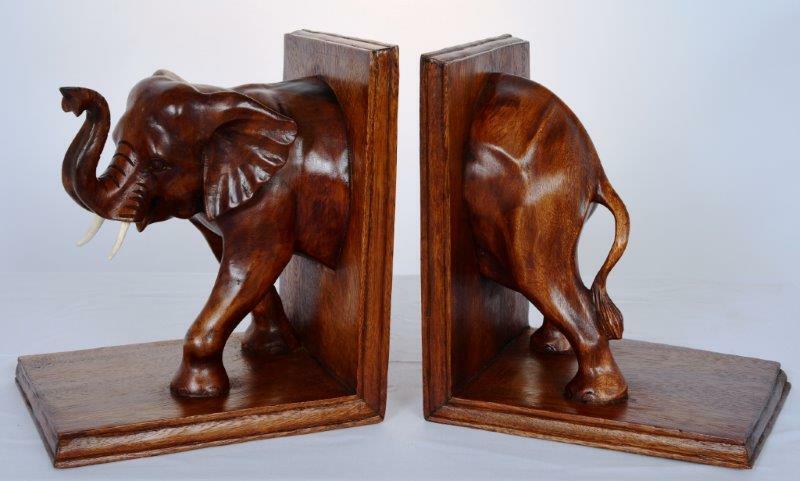 A pair of hand carved elephant book ends. 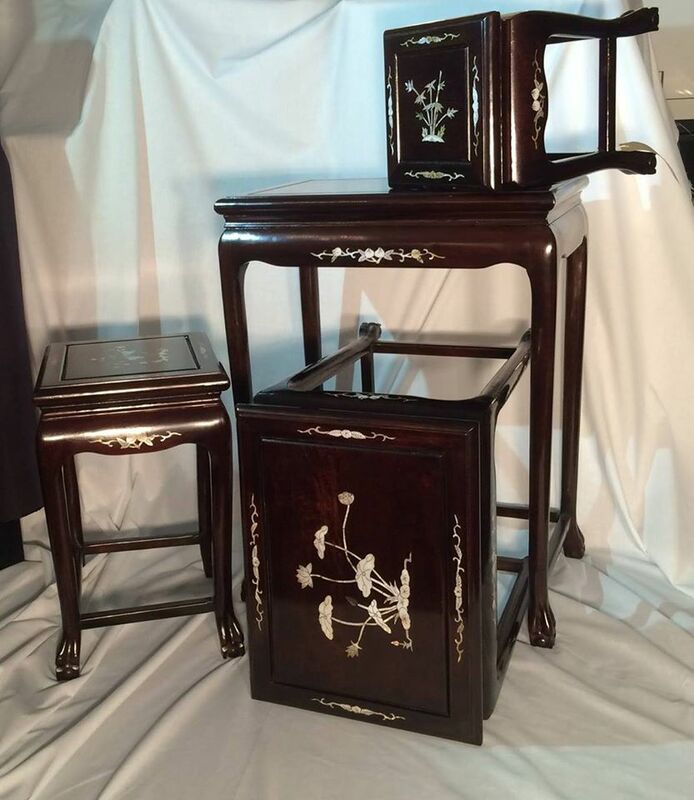 A very attractive nest of 4 rosewood tables hand inlaid with a unique mother of pearl design. 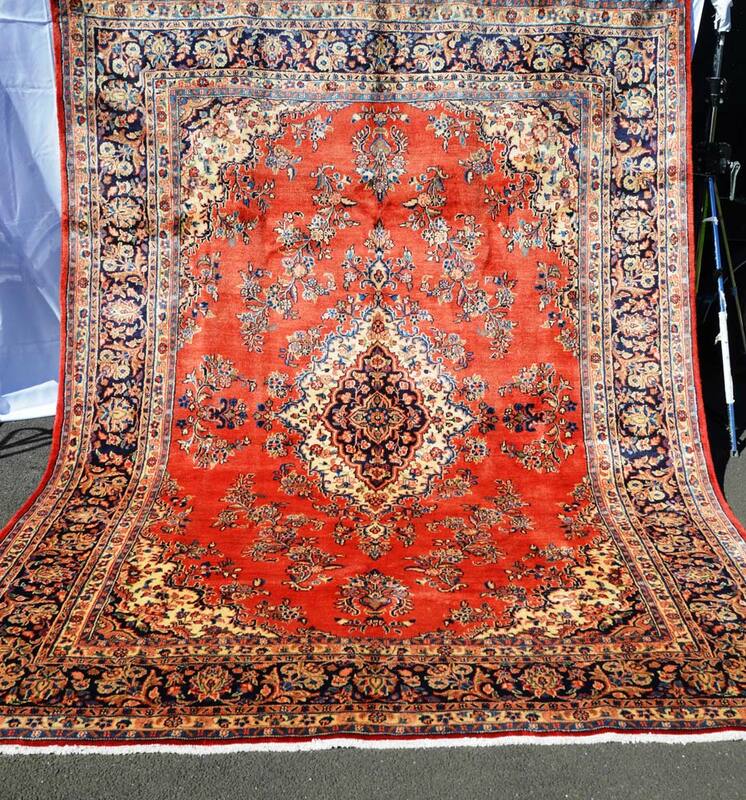 Hand made Persian carpets - Assorted designs & sizes from (1.5m x 2.5) to (4m x 3m) fantastic detail 100% wool selling for a mere fraction of the bonded warehouse price! 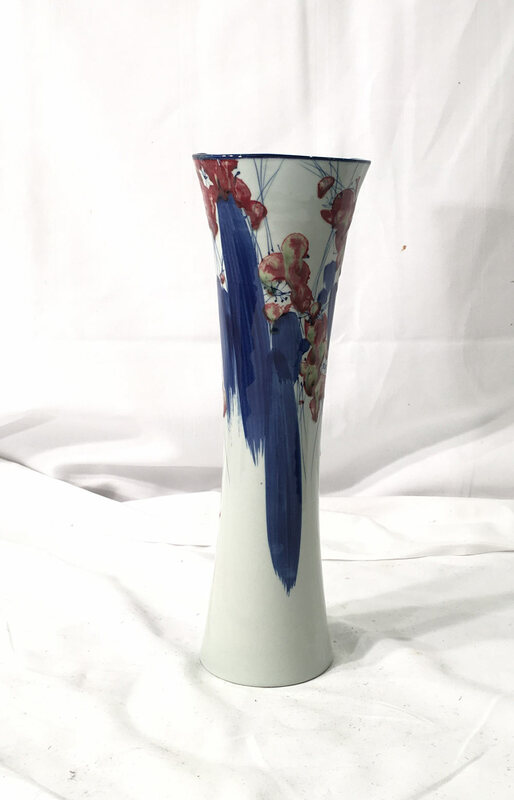 Hand made and hand painted contemporary artistic chinese vase approx 14” high “a unique item” . 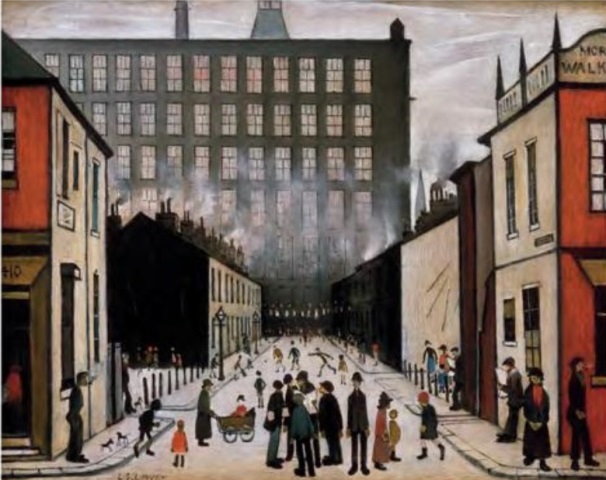 One of the finest Lowry’s from the collection, there were 95 published in this special edition, it comes with a certificate. 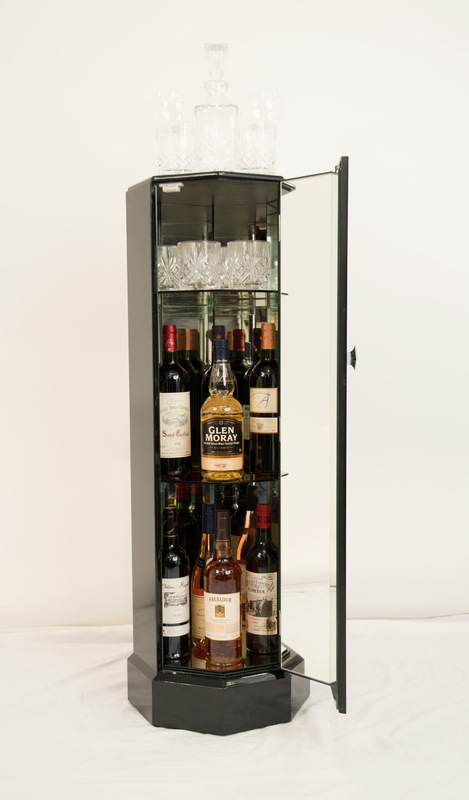 An elegant cocktail cabinet with a mirrored glass display finished in a black lacquer, when the door is closed the innocuous hexagonal design lends itself to a nice accent item of furniture. A case of 6 bottles “ Founders Reserve “ a true classic from Scotland’s oldest single malt whisky brand. 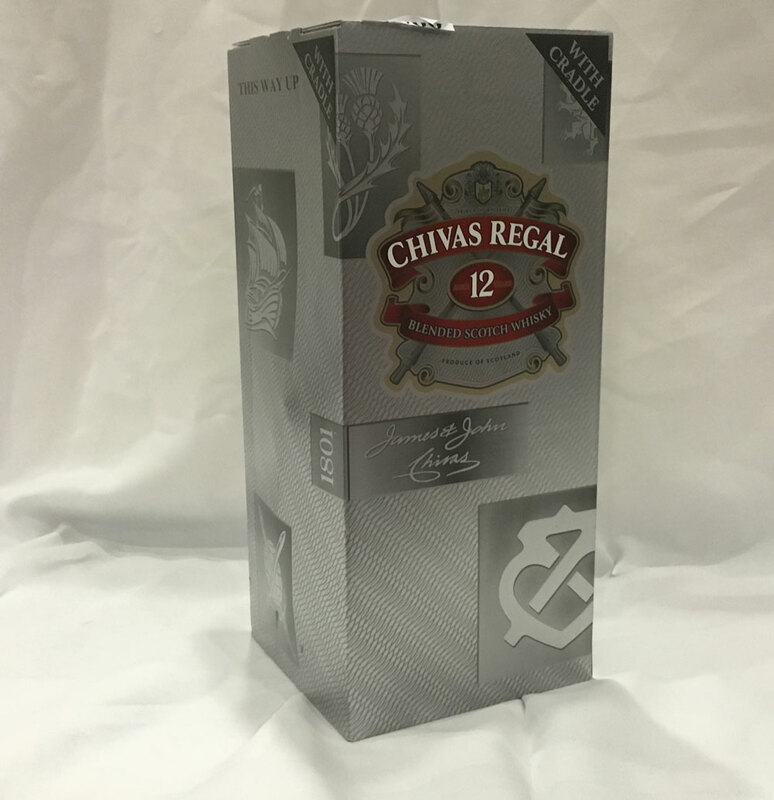 A 4.5 litre bottle of 12 year old Chivas Regal on swing stand. 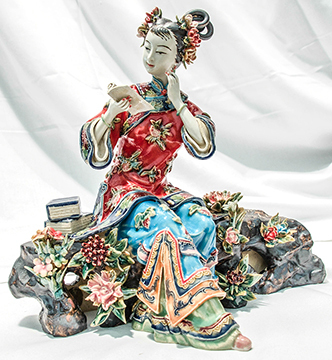 Hand-made very fine porcelain Oriental Lady. 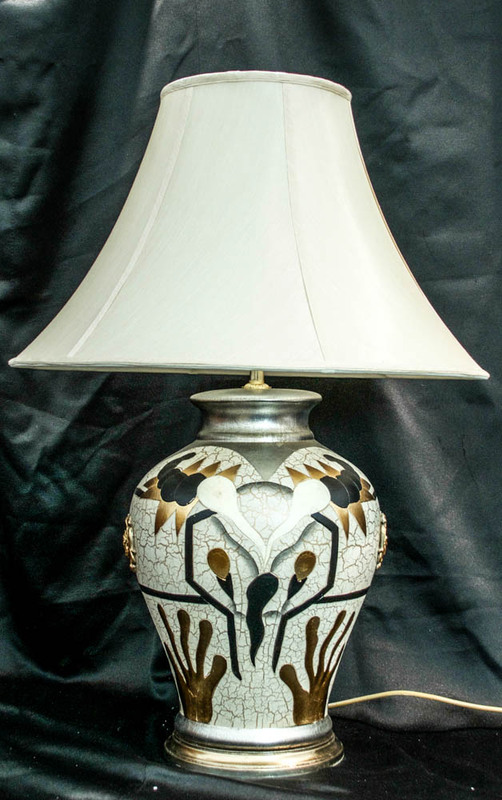 Very unusual "Deco" style table lamp which has been made from porcelain and hand-painted. 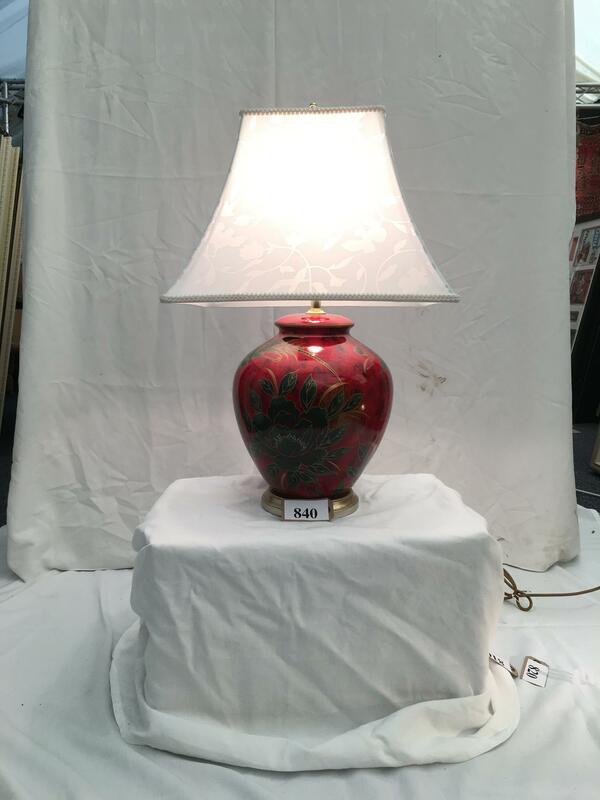 Very fine artwork on this beautiful "Japanese blossom" style porcelain lamp. 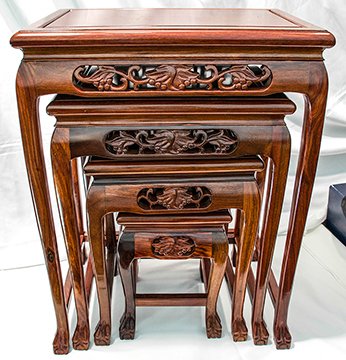 Hand-made solid Rosewood nest of 4 tables. 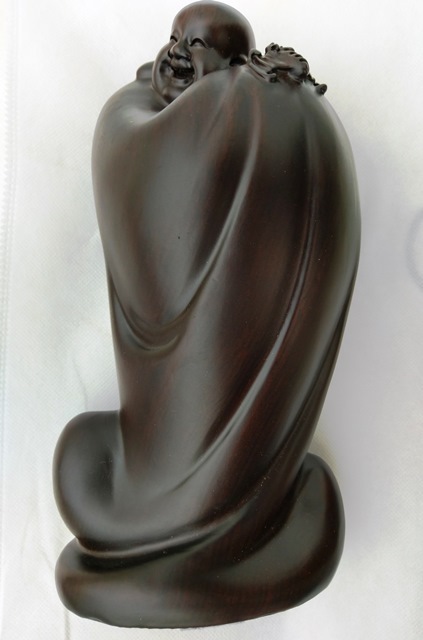 Beautifully carved by hand. 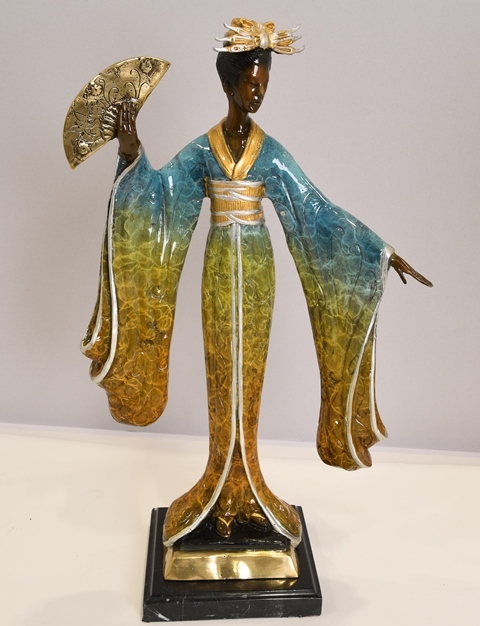 Hand-made from fine porcelain. This very finely made figure will be sold with No Reserve. 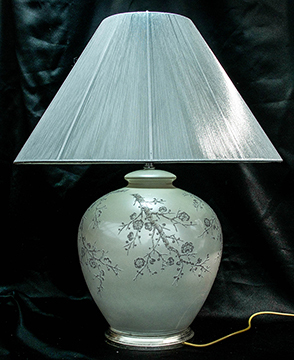 Very fine artwork by hand has been used to achieve this beautifully designed porcelain lamp. Tie and Cufflink Set with 5 beautiful silk ties and 5 cufflinks. Presented in a lovely rosewood storage box. 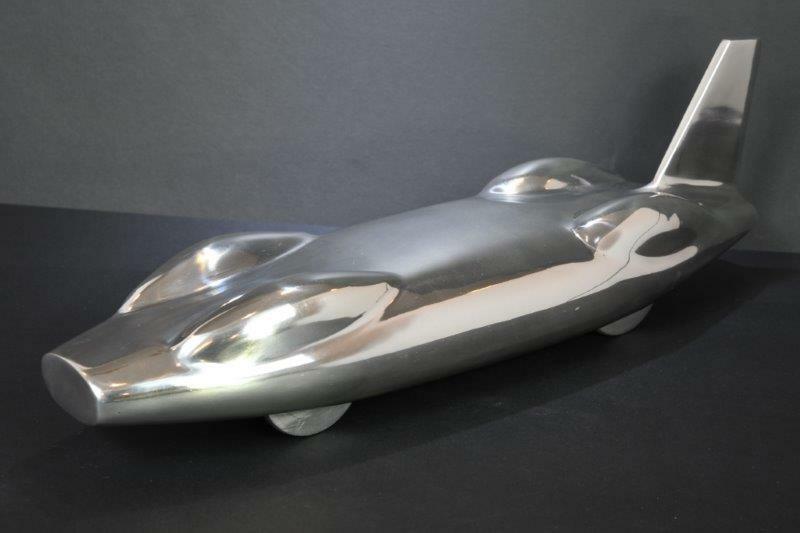 This would cost hundreds of pounds and has a extremely low reserve. 12 Year Old Single Malt Case of 6. A case of 6 bottles “ spey cascade“ a lovely tasting malt. 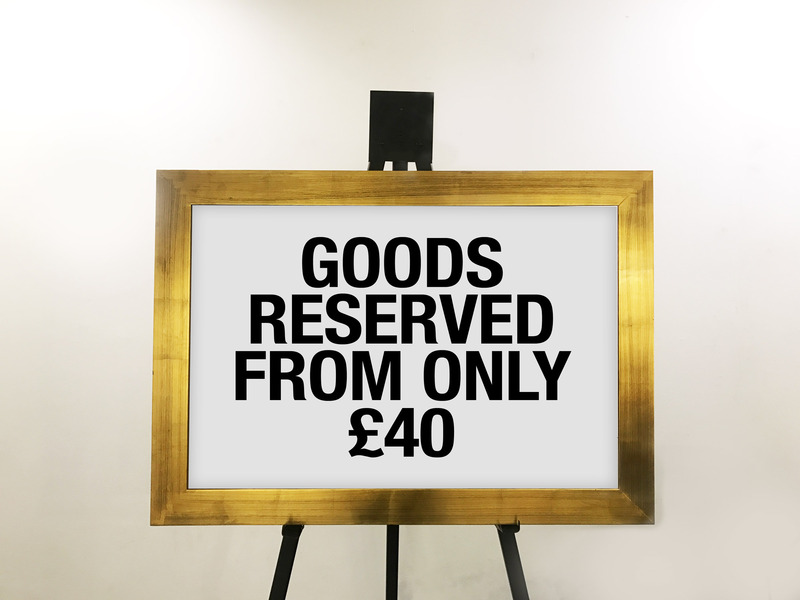 This limited edition print comes beautifully framed and accompanied by a Valuation & Authenticity Certificate. Black Apple watch (series 2) in sealed box and full warranty *Brand New.